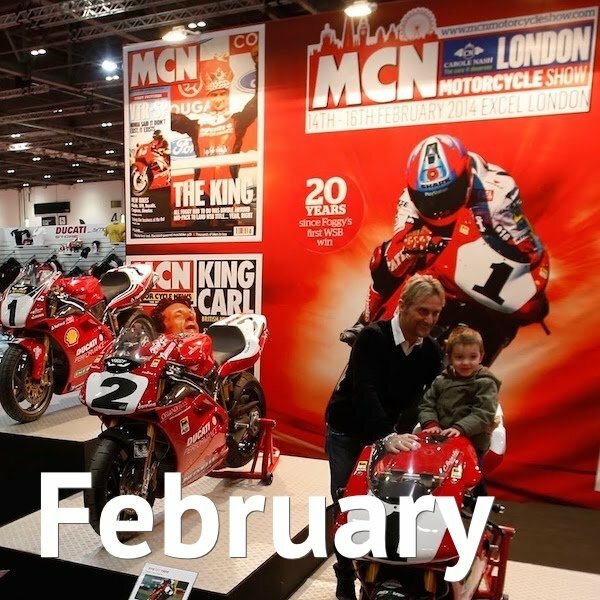 Biker & Bike’s February Motorcycle Events Calendar lists all of the premier motorcycle events in the UK (and quite a few smaller and local ones). If a starting time isn’t shown, please use the link provided to the organiser’s website for more details. All prices are correct at the time of publication, but may be subject to change. Other prices, concessions and earlybird discounts may be available. Hugely popular with families, this import from the States has everything – stunts, racing and a tinnitus-challenging atmosphere. Better still, it’s all indoors so it can’t be rained off. The series only lasts six weeks at various venues until the end of February, so if you want to see some back-flips, 360’s and actual competitive racing, get in quick. You don’t have to apply for a race licence or own a supercar, most drivers who come along will be racing in normal road cars and bikes. You’ll be entitled to unlimited runs and you’ll receive a personal performance print-out showing your reaction times to the start lights, 60ft, 1/4 mile, 1/8 mile times and terminal speed. It’s recommended you arrive before 9.30am to ensure track-time. We can only accept a limited number of sign-ons, so arrive early or pre-book to avoid disappointment! Prices: £10, plus a one-off signing on fee of £25 for drivers for unlimited runs or £10 for passengers going down the strip. (Attracts] 1,500 to 2,000 riders depending on the weather and location. The rally is famed for its toughness and spartan facilities. 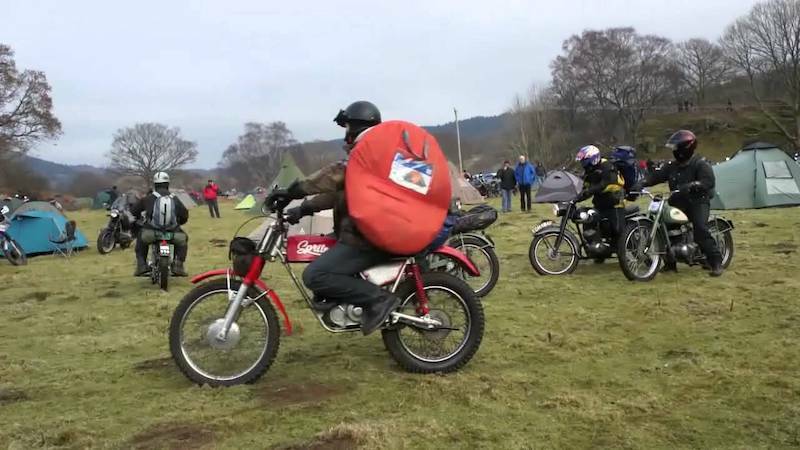 Riders often have to endure miserable riding conditions to attend the rally and, once on site, they are expected to camp without regard to the weather conditions. It is an event held in veneration by large numbers of motorcyclists as a test of stamina and endurance because (in the first two decades at least) it was common to have to endure snow and ice to ride there. The Dragon is often grouped with the German Elefantentreffen (Elephant Rally) and the Norwegian Krystall Rally. All the latest and greatest bikes, clothing and accessories, but also provides free live action from some of the biggest names in biking plus demo’s, talks and interviews in our sports and performance, custom, adventure and classic zones. Coys, one of the UK’s leading historic automobile valuers and auctioneers are returning to the show with a selection of stunning, rare and unique motorcycles to be auctioned off on Saturday 17th Feb.
Prices: Adults £18 (£15 in advance), kids under 15 free. This is more of a car and monster trucks event if we’re to be honest, but bikes do feature. Expect big jumps with acrobatics in between and the usual skids and slide control antics. Telford’s annual off-road and road-racing show has a tradition of drawing the biggest names and 2017 is no different. Clubs and private entrants will pack into the venue once again, bringing together the most fascinating collection of historic off-road machines you’ll find under one roof, and they’ll be joined by a raft of traders offering everything from parts and spares through to accessories and riding kit, plus project bikes…if you’re tempted. A smaller, more intimate version of the main Overland Event aimed at bikers who venture further than the nearest cafe. Workshop speakers include adventure idol Austin Vince as well as Steph Jeavons, Aaron Mitchell and Nathan Millward. There will be music on the Saturday and Friday nights, films, and welcome treats that include a free beanie – the essential piece of kit when camping in winter! Spaces are limited so book early as there will be no tickets available on the gate. NOTE: This event was due to be held at the beginning of the month but was postponed due to the weather. An event that many deem as their favourite of the year. 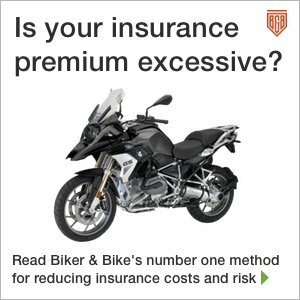 With a friendly atmosphere, Classic Bike Shows’ annual trip to Britain’s southwest is well known for the extravagant exhibitions put on by the local motorcycle clubs who go all out to impress. Add several inside halls filled with a blend of traders, dealers and autojumble stands, it’s a must for any true classic enthusiast. There are a number of parties and co-celebrations happening across 2019 for the 59 Club’s 60th Anniversary, but this event is closest to home for the club, born as it was from the heyday of cafe racing between the various cafes around London’s orbital ring roads, the Ace being one of the main venues. If you are not familiar with the 59 Club’s full story take a look here or better still, come and meet some of the original members on the day itself.